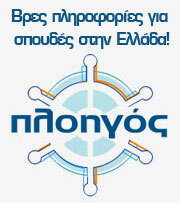 In Greece, the responsibility for administering career guidance services in the fields of education and employment lies with the Ministry of Education & Religious Affairs and the Ministry of Labour, Social Security & Welfare, through the activities of the NATIONAL ORGANISATION FOR THE CERTIFICATION OF QUALIFICATIONS & VOCATIONAL GUIDANCE (EOPPEP) (www.eoppep.gr). In this respect, EOPPEP acts as the national coordination body, implementing systemic guidance interventions, which ensures the quality provision and the professionalization of career guidance, the networking among the different guidance stakeholders and the constant development of information, guidance and counselling tools and material for the guidance practitioners working in education and employment settings in the public and private sector. In addition, innovating guidance services for the end users of all ages are also developed within the activities of EOPPEP at national level. The Portal was developed by EOPPEP at the end of 2012 is widely used by secondary and upper secondary students, young people and guidance practitioners. 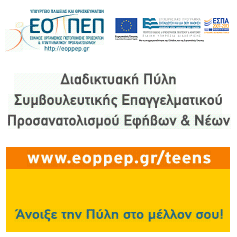 Friendly career tools enhance the access of more users to career and educational guidance, such as: digitized interest, values and decision making tests, e-portfolio development tool available also in English language, “ask the counsellor” section http://www.eoppep.gr/teens/index.php/consultant/16-symvoulos where you can contact a guidance counsellor serving in one of the 79 regional Counselling and Guidance Centers (KESYPs), administered by the Ministry of Education and Religious Affairs, thematic information catalogues and other useful links. The Greek Real Game for adolescents aged 12-15 and 15-18 and also videos for professions and basic skills, will be also found in the portal very soon. 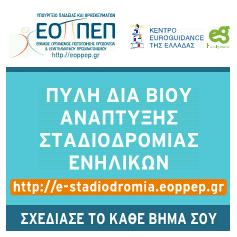 The newly developed Lifelong Career Development Portal is supported within the activities of EOPPEP as the Euroguidance Centre of Greece, providing innovating services for career development and mobility information targeted to adults of all ages. In the portal you can find digitized career tests, E-Counselling Services (soon to be launched), E- Lifelong Career Portfolio Development Tool which is available also in English language, Career & Mobility information Resources, Career Management Skills Section. In the field of Tertiary, Education Career Liaison Offices, Internship Offices and Innovation and Entrepreneurship Units operate in Universities and Technological Educational Institutions, with the aim to support students and graduates in the transition phase from education to employment. Services offered include liaison with the labour market, opportunities to meet with potential employers during Career Days, provision of information about postgraduate studies and scholarships in Greece and abroad, individualized and group counselling to enhance the students’ career management skills.